CLIA-waived CoaguChek XS Meter Professional Care Kit offers simplified testing and instant results when monitoring patients on anticoagulant medications. The handheld, battery-powered device is ideal for use in mid to high volume clinics, where it provides enhanced connectivity, accuracy and flexibility. Its advanced technology offers a smarter way to test at the point of care. Simple, efficient testing: CoaguChek XS uses a capillary whole blood sample from a simple fingerstick test to determine prothrombin and international normalized ratio (PT/INR) results, on-the-spot at the point of care. Instant results eliminate waiting for laboratory results to be returned, and offer increased peace of mind when monitoring Vitamin K antagonist therapy. They also offer clinicians the ability to test patients and adjust the dosage of anticoagulant medications in the same session. To perform a test, a small (8µL) blood sample from a fingerstick is applied to a test strip, which is then instered into the meter. Within a minute, an onboard quality control test and the required analysis have been completed, and results are displayed on the device's LCD screen. 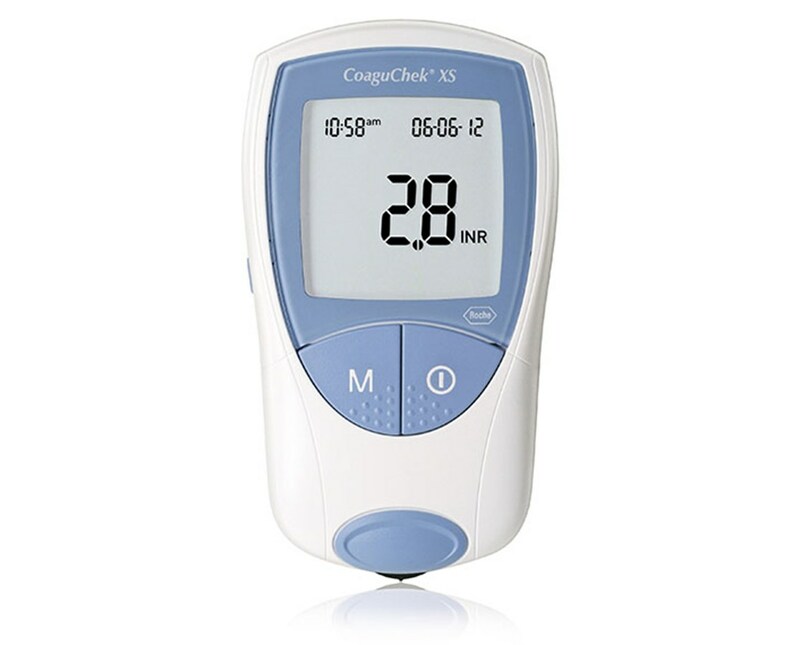 Easy to use: CoaguChek XS Meter includes several features which have been designed to make use as simple and hassle-free as possible. The test strips required for use with this device have large top and side dosing areas, enabling easy sample application. This application occurs outisde of the meter, which helps avoid cross-contamination and ensures clean testing. The strips have a 21-month shelf life from the date of manufacture, and do not require refrigeration. This device has been designed for consistently easy use requiring minimal maintenance: calibration information is provided by a coding chip included in every vial of test strips, meaning no manual calibration is necessary. Additionally, this meter does not require the use of pipettes or the preparation of reagents, further simplifying use. Quality control for high accuracy: CoaguChek XS is the only blood testing meter with inbuilt quality control. It examines every test strip for integrity while performing the required VKA analysis: both tests are done on a single chamber of the test strip. CoaguChek is also the only handheld monitoring system which neutralizes therapeutic levels of heparin (up to 0.8U/mL) and LMWH (low molecular weight heparin) (up to 2IU/mL). It also corrects INR values for hematocrit within a specified wide range. These onboard controls mean that no external quality control is necessary. However, it features flexible QC options, including an optional operator and QC lockout system. This allows for independent liquid control testing to meet a facility's regulatory requirements, enabling use in any environment. The combination of automatic calibration, inbuilt and optional quality controls, and correction and neutralization allows CoaguChek to offer precise results which are approximately 97% accurate when compared to standard lab results. 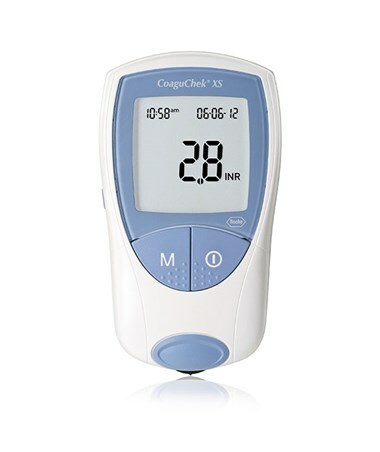 Streamlined data management and connectivity: CoaguChek XS Meter allows practitioners to manually enter patient identification information, and add comments after results are delivered. This device also offers extensive data management options, designed to help practitioners streamline data management across a facility. The device has exceptional memory capacity, capable of storing 300 patient results with the test date and time. Easy to use: CoaguChek XS runs on 4 x AAA batteries, allowing for full portability which facilitating easy use across a facility or facilities. It can also be powered directly from an AC mains switch. It features auto-power, which automatically turns the device on when a test strip is inserted, and turns it off three minutes later. This meter is designed to be user friendly: it features an icon-driven, full-color, touchscreen interface for easy, intuitive use.